Every organization — regardless of industry — is now a technology organization. But rising information chaos is a very real and strategic threat to the ability of organizations to succeed, or even survive. In this rapidly changing environment four forces are aligning to create new demands upon the content management capabilities within organizations. 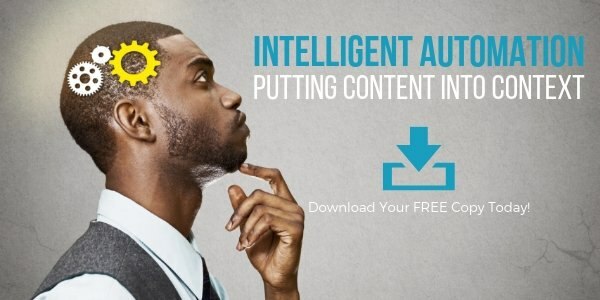 It is no longer enough to just store and archive content; it must be put to use in context as part of a broader drive to Intelligent Automation. Traditional ECM and BPM solutions focused on automating large-scale, document-intensive, mission-critical processes — and they largely accomplished this mission. Traditional solutions have not kept up with the exploding volume of information and a new generation of process challenges driven by the need for intelligent automation. Effectively integrating unstructured information and content into lead business applications — like ERP, CRM, HR, and Office 365 — remains a key stumbling block in the drive to Intelligent Automation. Business processes do not exist in isolation; they are part of a broad value chain that is defined by the content that flows across processes and departments. Learn more with this FREE ebook.